This full-length documentary shows how Charles and David Koch, two of the world’s richest and most powerful men are polluting the environment and bankrolling a vast network of organizations dedicated to serving the interests of large corporations. 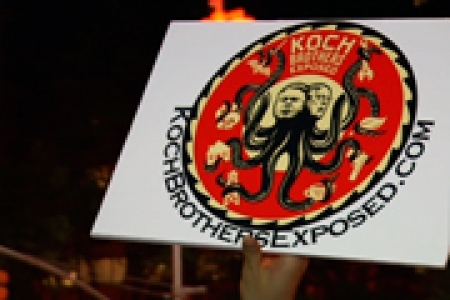 See what your favorite organizations are doing to fight back against the Kochs/ALEC and how you can help. Hey the tentacles in the add are just like the ones in an old Standard Oil political satire cartoon from the 1890's. What is worse? The Koch Brothers, or George Soros, and the uber-rich, morally bankrupt Hollywood crowd that raised $15 million for Obama recently. Little folks like me wonder why super rich folks like all the aformentioned get insider treatment, like access to the White House, (or Starbucks to prevent their names from showing up on a WH register.) or favorable treatment like a $528 million handout? (Solyndra) Unfortunately favoring rich donors is a double edged sword BOTH parties pander too.